Greenwich Village’s House of Genius was the iconic home of many writers and artists. Despite a preservation struggle, it was demolished in 1948. Some of the more notable residents included Willa Cather, Stephen Crane, Frank Norris, and Alan Seeger. Mme. Branchard was known in the Village by her guests as a generous landlord because she exclusively rented to artists even though they were often late on rent. On her 80th birthday, Village residents arranged for a procession around Washington Square Park in a horse drawn buggy. At the birthday celebration, Branchard comically remarked, “Art is grand and literature is wonderful. But what a pity it is that it takes so many barrels of liquor to produce them. Why this is not a house; it’s an aquarium.”6 Mme. Branchard passed away in 1937. The House of Genius in Greenwich Village never received landmark designation. It was demolished in 1948 and replaced by NYU housing. The campaign to save the House of Genius was one of the early preservation battles prior to the passing of the New York City Landmarks Law. Local Greenwich Village residents along with community organizers fought for its protection based on its cultural and artistic significance. 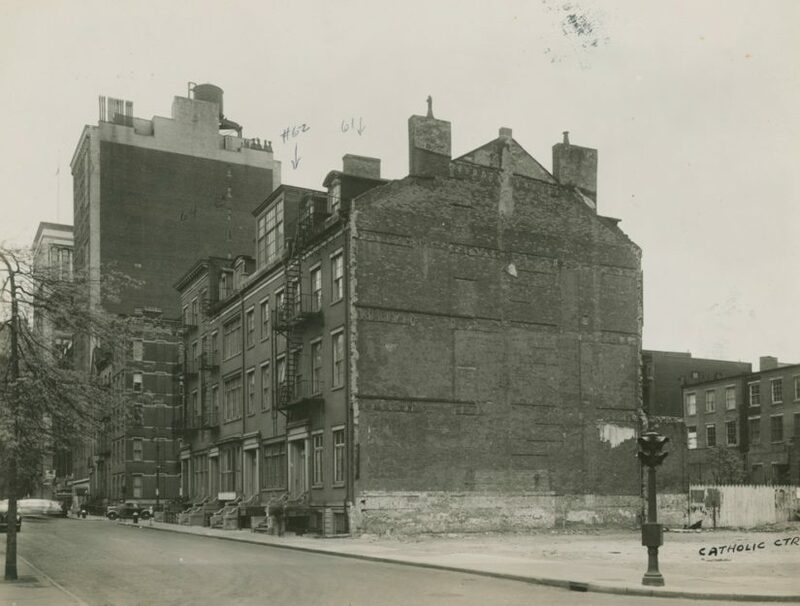 In 1948, Anthony Campagna was granted eviction certificates from the City.14 He demolished the first row house at 64 Washington Square South in March of 1948. However, after the buildings were demolished, the proposed apartment building was never built. Robert Moses encouraged Anthony Campagna to sell the property to New York University.16 This further fueled the fire for Village activists who feared New York University's buildings would overtake the Village and destroy its historic charm.17 The loss of this battle served as an impetus, motivating Villagers to fight to preserve their neighborhood. This fight would eventually lead to the designation of the neighborhood as a New York City Historic District. Historic American Buildings Survey, “Sixty-One Washington Square South” Library of Congress. Michele H. Bogart and William R. Taylor Et al. Painting the Town: Cityscapes of New York: Paintings from the Museum of the City of New York (New Haven: Yale University Press, May 2000). ”Mme Branchard of ‘Village’ Dead,” The New York Times, 10 January 1937. ”Wreckers Start on ‘Genius Row,'” The New York Times, 18 March 1948. ”Art Center Lost, Bishop Announces,” The New York Times, 28 June 1948. ”Evictions Upheld on Washington SQ,” The New York Times, 7 January 1948. Lee E. Cooper, “‘Genius Row’ Sale to N.Y.U. By Builder Arouses Village,” The New York Times, 16 July 1948; “Moses Faces Sales Query,” The New York Times, 20 July 1948.